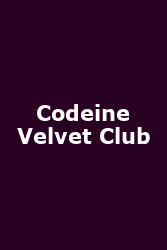 Codeine Velvet Club are brand spanking new. Fronted by Lou Hickey and The Fratellis' Jon Lawler, their debut single, 'Vanity Kills', is available on download from Monday 2 November with a vinyl release later in the month. Their self-titled debut album is released on Monday 28 December. Lawler took the title of the Fratellis' breakthrough hit, Chelsea Dagger, from his wife Heather's stage name (she is a Burlesque dancer). Maybe she worked at the Codeine Velvet Club. To date, fans have enjoyed little more than faint whiffs of Codeine on the band's website (www.codeinevelvetclub.com) and MySpace page (www.myspace.com/codeinevelvetclub), plus there have been just three gigs so far. These were in September in London, Glasgow and, er, Ullapool. Their first major tour kicks off with the first of 13 dates at Manchester's Ruby Lounge on 18th November and closes at the Leadmill, Sheffield on 6th December. Tickets are available from Friday 30th October at 9AM, costing £8 for the regional dates, £10 for the London (100 Club) date.